The Copper and Lumber Store Historic Inn was built in 1789 to house the materials for repairing and maintaining the wooden sailing ships of the British Navy. As the European colonization of the Caribbean grew, the British Navy patrolled the waters to protect the interests of the Crown. Its navy needed local ports, such as the naturally advantageous English Harbour. As the ships were repaired in harbor, sailors would rest in the Georgian-designed building that was made of yellow bricks carried from Britain as ballast. 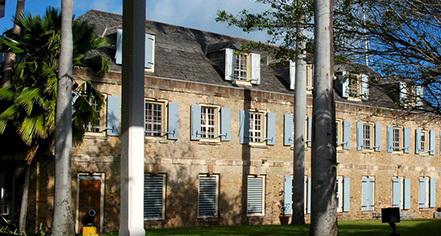 The building was an addition to the already thriving Naval Dockyard, which was later renamed Nelson's Dockyard in honor of famed Vice-Admiral Horatio Nelson, who served at Antigua from 1784 to 1787. The Royal Navy used the Dockyard throughout most of the 19th Century and abandoned it in 1889. In 1951, a group of preservationists, The Society of the Friends of the English Harbour, began to restore the Dockyard. That project would eventually become part of Nelson’s Dockyard National Park, a UNESCO World Heritage Site and the largest of Antigua’s National Parks. Today, while also serving as a working Dockyard for various ships, the Park houses amenities such as shops, restaurants, and marina businesses. The restoration of the Copper and Lumber Store Historic Inn was completed in 1988. 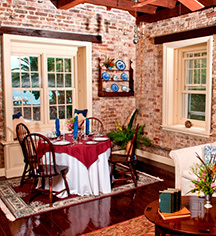 All fourteen of the guestrooms are located within the historic structure and have been maintained to include the best elements of the Georgian look and feel, while catering to guests of today.